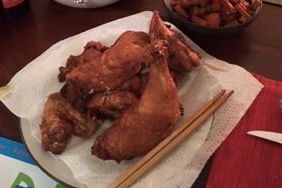 Just over eleven years ago, JMP and I posted a recipe for Javanese-style fried chicken, ayam goreng. Having recently cooked a version of the same dish, using only ingredients found at the local grocery store, I figure it’s time for an update. This method simplifies the preparation greatly, but preserves the essence of what makes Javanese fried chicken good. The key to this is the marinade: be sure to let the chicken sit for at least 4 hours, preferably overnight, in the marinade before proceeding. Combine all of the ingredients except for oil and chicken stock in a bowl, then marinade for at least 4 hours, or preferably overnight. While the chicken is resting, heat the oil to 350 degrees. Working in batches, fry the chicken pieces for 5-10 minutes each, turning once or twice, until dark brown.